Challenge is perhaps another name for life, and struggle is another metaphor for existence. We never know what surprise lies in store for us, a few hours from the present. And yet, we move on. We move on, not because we are great warriors, but simply because for most of us, life is actually not that harsh. But for some, life can be ruthless. When Dilip Deka, a medicine shop owner and his wife Kalyani arrived in Guwahati on June 6 2008, carrying their 4 years old feverish son, they did not know that for the next three years their little son would only be a frozen self of himself. After a brief stay at the Sanjeevani Hospital, Guwahati, the couple shifted the child to International hospital on June 7-where he was prescribed a MRI scan. With the hospital not having a facility for MRI, the patient was taken to a nearby diagnostic centre for the same. Recounting those horrible moments Dilip Deka says, “While returning from the diagnostic centre, babu developed a severe respiratory problem in the ambulance. There were some difficulties in removing the nut-bolt of the oxygen cylinder and I became very nervous. Those were bad times….only a father can understand.” Reaching the hospital, the patient was rushed to the paediatric ICU, and that was the last time the couple interacted with their son- Hrittik Raj Kashyap. I had heard a lot about this couple and their struggle with their son’s life, and always wanted to meet and talk to them. Finally, in the late May, 2011, I succeeded in meeting the family. Hrittik, a KG student of Frontline English School, Baihata Chariali, had then been quite healthy and sporty, always with a smile on his face till early June 2008, when he started speaking in delirium and developed fever. In the MRI he was diagnosed with ‘Japanese encephalitis’ and on June 8th young Hrittik was put under the ventilator. On a practical note, that day when the doctor read out the MRI report Kalyani Deka didn’t know that her son would plunge into a deep sea of unconsciousness for an extent which no one could predict. 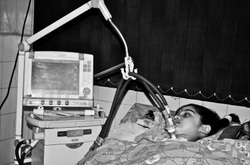 For three years now, Hrittik is under that ventilator, opening his eyes sometimes, twisting his lips, smiling when his mother tickles him and sometimes restlessly kicking the nurses when they give him injections. ‘Japanese encephalitis’ is a neural inflammation and infection of the brain causing neural disturbance and damage. Its severity is much more pronounced on children than on adults. In patients who develop complications in the central nervous system, lifelong neurological defects such as deafness, mental retardation are expected. Domestic pigs and wild birds are reservoirs of the virus. One of the most important vectors of this disease is the mosquito ‘Culex tritaeniorhynchus’. This disease is most prevalent in Southern East Asia and the Far East. Hrittik’s parents soon realised that the treatment would be a very costly one, especially considering the uncertain prognosis of the disease. They discarded the idea of an airlift to Apollo, Delhi considering the huge cost of the entire process. Instead they suggested to Dr. Prakritish Bora, senior consultant International Hospital, Paediatric Department to call experts from Delhi. After a few days, Dr. Dhiren Gupta from Gangaram Hospital, Delhi came to check Hrittik. He checked the young boy’s pupils and told the parents that the case is “not hopeless” and efficient medical care may return their son to them- though maybe in a paralysed state. Hrittik’s parents took a cabin in the hospital for themselves for a few months, but unable to manage it financially, decided to let it go and sleep in the lobby outside the ICU. Things were going out of proportion and the couple didn’t know which way to turn. Doctors told them that sleeping in the common lobby for a prolong period might lead to them being hospitalised. The couple started searching for a room in a lodge or a rented house, and they faced tremendous problems in that too. Mr. Deka says, “Some of them worried that we wouldn’t be able to pay them the rent, while others had issues with us returning at about mid night from the hospital.” Somehow they found a lodge just behind the hospital complex and stayed there for some time until it was taken over by builders for newer constructions. Then started another desperate search for accommodation in this busy city bustling with selfish activities, and finally they found a rented house at about three thousand rupees per month. Dilip Deka has given his lifelong earning for the treatment of his son. Till now he has already spent about 50 lakhs rupees, but they still owe around 28 lakhs more to the International Hospital (but the authorities have never put any financial pressure on the party) and another several lakhs to friends and relatives from whom they borrowed the money at the time of utter crisis. Hrittik’s father says, “Whenever there is an infection, the expenditure suddenly shoots up. We are then placed in a very difficult circumstance.” In late 2009, Hrittik developed a severe pneumonia and doctors almost gave up any hope for his recovery. Those frantic three weeks of pneumonia treatment struggling with the infection had cost about 1.5 lakhs. Chief Minister of Assam donated about 50 thousand rupees for Hrittik’s treatment while the Jalukbari Block Congress gave one lakh rupees for the purpose. Popular singer Zubeen Garg led a procession in the city and raised about 38 thousand rupees for the diseased child. Several media houses including NDTV broadcasted the family’s plight, and that paved the path for donations from all over the world. Help in the form of about 15 lakh rupees poured in from Singapore, Abu Dhabi, Qatar, London, and the USA. Well wishers from all over Assam, came forward with whatever they could. Hrittik’s encephalitis has paralysed his body and damaged his brain. Many of his vital activities have stopped for good. Probably he will never talk or walk again. His treatment now consists mainly of palliative care, caution against any infection and physiotherapy. Every day for about an hour or two, the ventilator is put off, to allow Hrittik’s body to accustom itself with the natural environment, but after a stipulated period of time, he can’t stay normal and the machine is put on again. Prolonged ventilation has somehow made his body lose the spontaneity required for normal breathing. Hrittik’s grandfather believes that his grandson will return home one day, fine and healthy. His relatives visit him regularly in the hospital, pray with the family and are very optimistic about his recovery. Abhishek Saha was born and brought up Guwahati, Assam and has been writing short pieces on various social, cultural and political topics as well as poetry and travel stories since the last five years in The Assam Tribune, a leading English daily in the North East India. He has also been published in the Eclectic Times, a general interest monthly magazine.